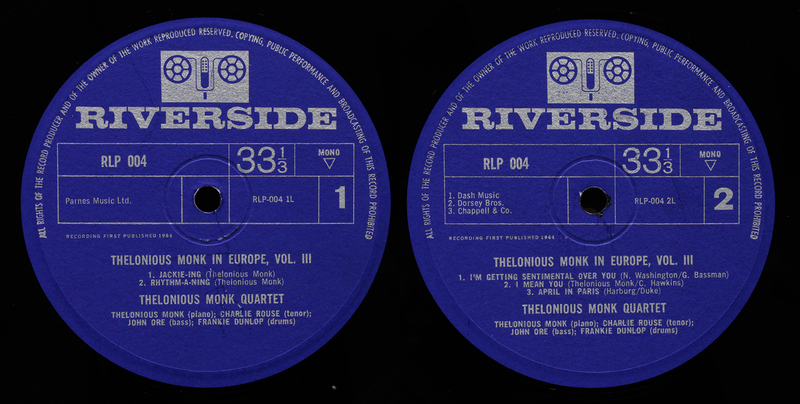 Monk tours Europe, a stopover in Paris for Volume Three of this farewell set of releases from Riverside. Monk treats the Paris audience to a short solo rendition of “April in Paris”, which was correct by both place and month, sort of Rock Concert opening line “Hello London! !” which always goes down well, unless this is actually Hamburg. The Parisian audience spot the tune at once, but it is given that unique Monk treatment. There is a certain hesitancy in the audience response – is that it? Is it a Monk pause, or is that the end? Imagine getting up and cheering wildly Encore! Encore!“, only to find you are the only one standing as the tune continues, ker-plink-plonk. Everyone is looking disdainfully through their nose at you. It’s not easy being a hipster. 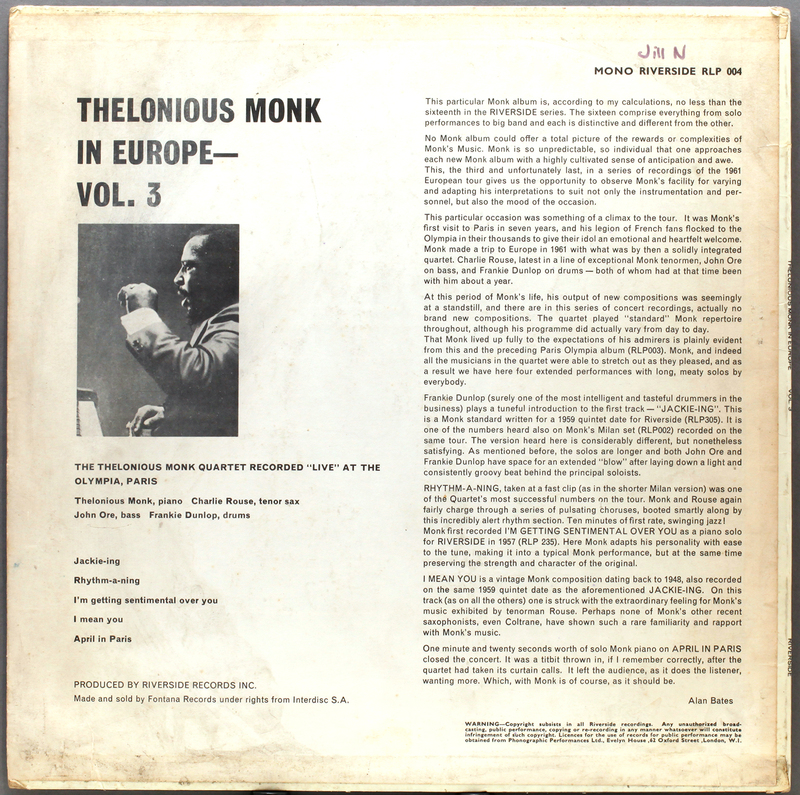 London record shop, no great cost or story, everyday price.Still looking for the supposedly “superior” Stockholm session, but this will satisfy the need for a feisty Monk live session, with Charlie Rouse steadfastly continuing to perform the impossible: play along with Monk. 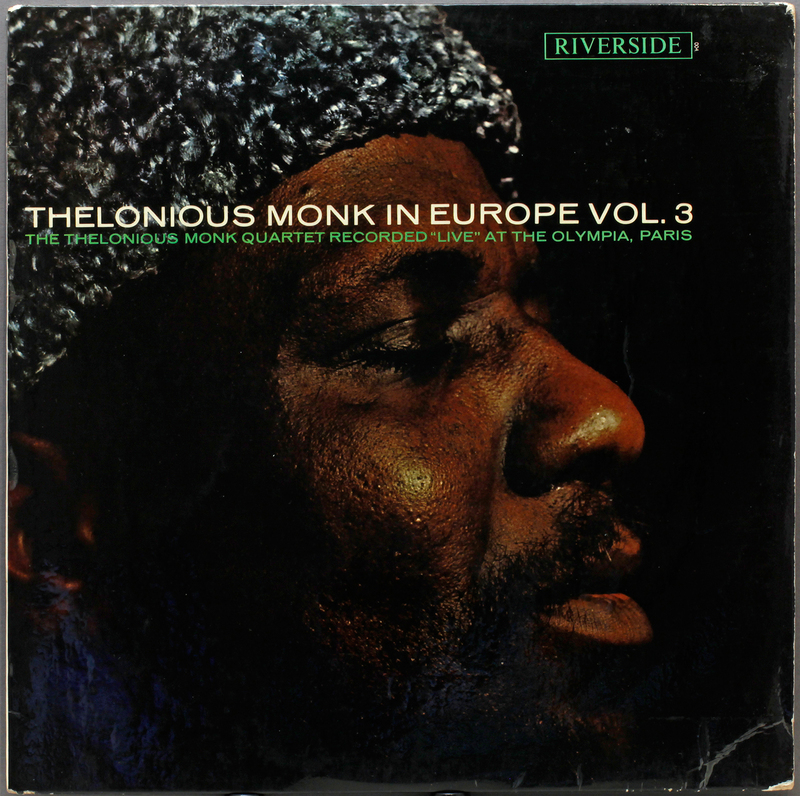 This entry was posted in Riverside, Thelonius Monk and tagged Europe, Frankie Dunlop, John Ore, RiversideTCharlie Rouse, Thelonious Monk by LondonJazzCollector. Bookmark the permalink. LJC, I imagine you know the Live at the It Club set? If not, there are some who would argue that that may well be the feistiest, finest live Monk there is. And although I don’t often play the CD version, it is a *whole* set, in sequence, and consequently a fascinating experience. Know it? Pah, of course! You are not talking to some Johnny-come-lately who has only recently discovered jazz…err… that should be “of course not”. Never heard of it. 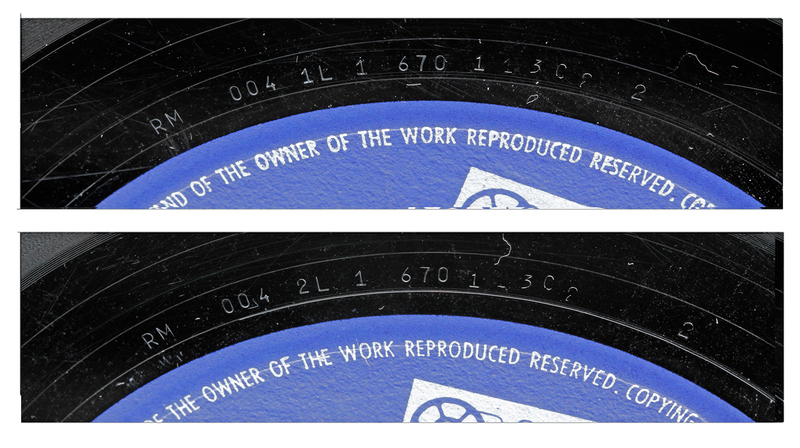 Apparently it is quite well regarded – but only available on tESD, not vinyl. Time to pay a visit to Amazon. Damn! The Ion mp3 turntable is a bit temperamental. The motor arm and cartridge must cost all of ten dollars and if it hits a bit of muck it does tend to skip where a “proper” turntable pushes through. I am not able to clean and rerip right now, so rather than take the sample down I will put up a hazzard warning and replace when I can. Thanks for the warning.